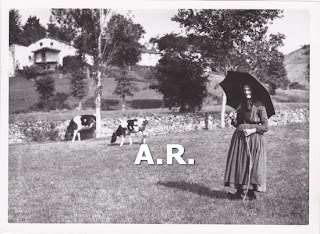 La vieja pasiega cuida sus vacas bajo el clásico paraguas para el agua, para el sol y para el resol. Llevando leche para las fábricas de productos lácteos Santander. Vemos en estas fotos , realizadas hacia 1937 diferentes escenas del paisaje y de la actividad de las gentes de Cantabria realizadas por el Marqués de Santa María del Villar. Todas las fotos llevan al dorso el sello del Ministerio del Interior lo que nos permite fecharlas hacia 1937/38 pues dicho Ministerio desaparece en 1939. Gran parte de su archivo se perdió durante la Guerra Civil, el resto fue adquirido por la Universidad de Navarra. La calidad fotógrafica del Marques de Santa Maria del Villar ha sido discutida, su pictorialismo se ve "antiguo", sin embargo pienso que no ha sido suficientemente estudiado y valorado. Su labor como precursor de la fotografía, impulsor de las sociedades fotográficas y, sobre todo, documental es de gran calidad. Estas fotos muestran su cercanía con las personas, con la gente. Gracias a la labor realizada por la Universidad de Navarra y sus grupos de estudio son numerosos los documentos sobre la actividad de este fotógrafo. La labor documental del Marques es realmente impresionante conservándose muchas de ellas hoy día ,ello a pesar de que parte de su archivo se perdió durante la Guerra Civil española cuando se incendió su estudio. La Fundación Universitaria de Navarra y su "Fondo Fotográfico Universidad de Navarra" con la colaboración de la Universidad Politécnica de Valencia ha dado el primer paso en la dirección de difundir a través de la red y preservar digitalmente el riquísimo acervo fotográfico que se conserva en la Universidad de Navarra mediante la edición digital de Fotografía sobre España en el siglo XIX. 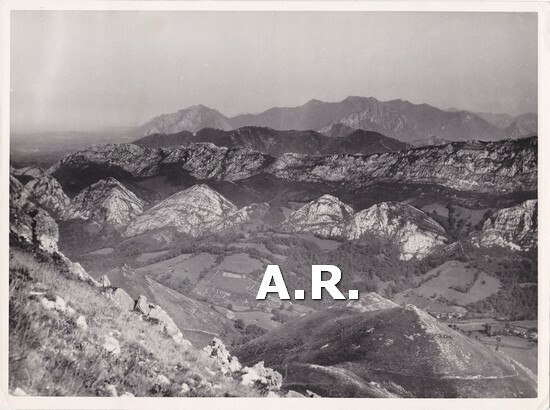 We see in these photos, taken around 1937 different landscape scenes and activity of the people of Cantabria made by the Marqués de Santa María del Villar.All photos bear the stamp of the Interior Ministry which allows us to date them to the Ministry for 1937-1938 disappears in 1939 on the back. On the activity of Service Devastated Regions see publication referred to Teruel with numerous data on its activity, legislation and operationMuch of his file was lost during the Civil War, the rest was acquired by the University of Navarra.The picture quality of the Marques de Santa Maria del Villar has been discussed, the pictorialism is "old", but I think it has not been sufficiently studied and evaluated.His work as a precursor of photography, photographic societies impeller and, above all, documentary is of great quality. These pictures show their closeness to people, people. His vast knowledge of the naturalistic and monumental wealth of Spain led to his being proposed in 1927 to chair the newly created National Tourist Board, a position he did not accept disinterest towards the administrative aspects, although personally he remained faithful to the charge actual address of the then fledgling tourism; his council building the first parador in Gredos is due. In 1936, his photo lab Street Segovia 3 of Madrid was destroyed, along with some of their files, estimated at some 75,000 photographs. After the war he moved to San Sebastián and, as a photographer, worked for twenty years as head of the Photographic Department Devastated Regions, which gave occasion to again make an interesting collection of great documentary and artistic value. He collaborated with magazines like Montes (1949), Reconstruction (1942-1954) and Basque Life (1949-1951), and his work was published in numerous magazines such as Black and White, Shadows and Vertex. After the Spanish Civil War he moved to San Sebastián, where he continued to work for the Photographic Department Devastated Regions until 1960. His early style was pictorial, but his work veered suddenly toward naturalism, immediately character, with a strong documentary and ethnographic value and impressionistic implications. It is well ahead of reportage photography to become general in the 50s and 60s. Thanks to the work of the University of Navarra and study groups are numerous documents on the activity of this photographer.Diego Quiroga and Losada, Marqués de Santa Maria del Villar was one of the great photographers of the twentieth century. Stresses in the first decades of its pictorial aspect and its activity as a driver of the photographic societies because he was a member of the Royal Society Outs Spain. His photographs are exposing every day more possible to know all facets of this photographer who loved his profession and has left us numerous documents from Spain. Not all photos are of equal quality but generally denote a trade and superior to many photographers of his era style. Your personal circumstances, personal ruin and advanced age, made when he started the interest for photography around 1970 about the criticism did not notice his work and had to be the University of Navarra, custodian of his legacy, which would give known through various exhibitions. It was also the first president of the National Tourist Board which later became the Directorate General of Tourism. The photographic backgrounds of the latter are in the General Archives of the State Administration in Alcala de Henares. More than 3,000 photos of this file, all places of Spain, are available in the Catalog Momental of Spain by Google Earth applicationThe documentary work is really impressive Marques preserved many today, despite the fact that part of his file was lost during the Spanish Civil War when his studio burned. Remember that the University of Navarra has a photographic background part of which can be seen on the webThe University of Navarra Foundation and its "University of Navarra Photography Collection" in collaboration with the Polytechnic University of Valencia has taken the first step in the direction of spreading through the network and digitally preserve the rich photographic collection preserved in the University of Navarra through the digital edition of Photography on Spain in the nineteenth century.